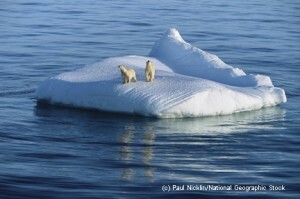 I just got back from seeing the IMAX film "Into the Arctic"- a gorgeous film with spectacular views of the wild arctic. It is amazing how many animals depend on the sea ice in different ways, and the ways that the decreasing ice has harmed them. Caribou need sea ice to migrate for birthing, now instead too many young are born during the migration... with few surviving. Grotesquely, fewer seals are being found for polar bears to eat, so male polar bears are now going after polar bear babies for food. 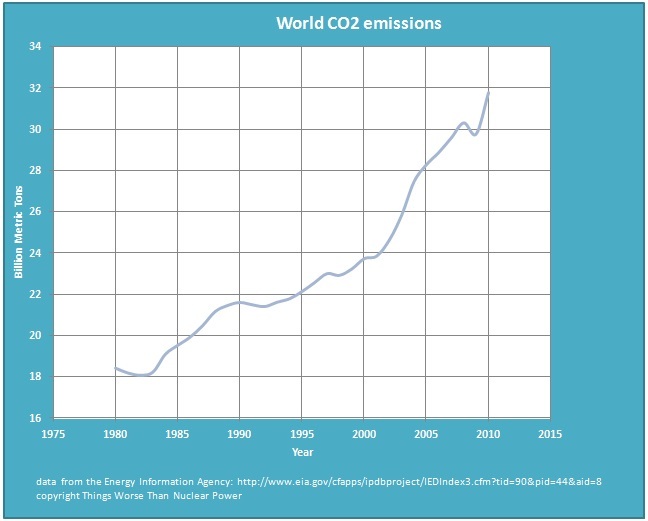 As we will show below, the world production of CO2 has only spiked in the last couple decades. Why, in the hay-day of renewable energy, have carbon emissions--and the pollution that goes with carbon-- not even slowed? Why are they increasing in Germany, the poster country for renewables? We have written about how Germany and Japan's emissions have jumped dramatically in the last couple years due to replacing their nuclear energy with coal or oil (not renewables). Here we see the tradeoff in countries around the world is really between combustible fuels and nuclear... in a clear cut way. What is the evidence for the dire situation our world is in? We know for one, that an increase in carbon has led to severe ocean acidification. We also know that in the last century, snow has been disappearing from mountains such as Mount Fuji and Mount Rainier, and that polar ice has been shrinking dramatically and much faster than predicted in the Arctic as recently as the 1980s. One might be tempted to say that China's far greater emissions is proportionate to its size. However, its GDP has only exceeded that of Japan's in the last few years, mostly after the data in this chart- after 2010. 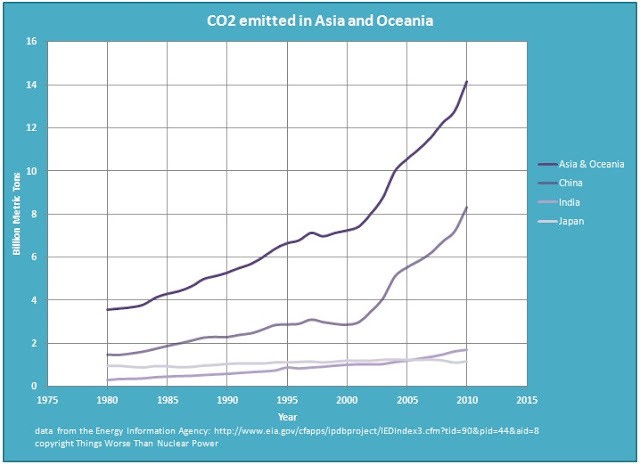 The truth is that dramatic jump in Asian emissions is primarily due to China's immense increase in coal power plants. If you see the American embassy's twitter feed on Chinese air pollution conditions (@BeijingAir), you will find what this has done to their quality of life and general health. Interestingly, Japanese emissions have remained remarkably stable over the last three decades, and is surprisingly low. This is due to their significant amount of nuclear energy (until 2011). 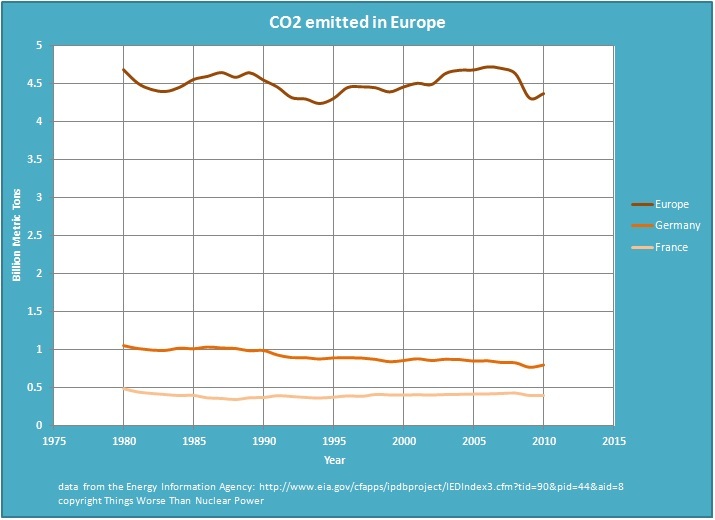 In Europe, we also see that the countries with the least CO2 emissions are the ones that have significant nuclear generation. Again, we know that since 2011, Germany's closure of nuclear power plants and investment in "clean" energy has already dramatically increased carbon emissions, costs to consumers, and unreliability. Below we see that historically, France has had almost half the emissions that Germany has, due to it's 70%+ nuclear base power. 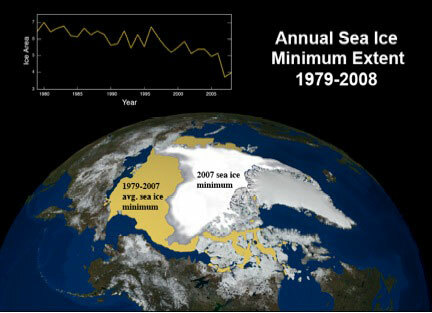 Want a white Christmas next year and a healthy Arctic? Nuclear energy is the only solution to providing reliable power for healthy economies without carbon dioxide emissions (along with other pollution). The graph for Europe is a bit empty. Can we have a comparison to countries without significant Nuclear power use, as well as per head of population? Sure. I first made the chart with all the countries, but it was pretty busy. Send us an email and I can send you the version with all the countries. I didn't make it per capita, although that is a good point. The data is all available from the source, EIA, as cited on the bottom of the chart.